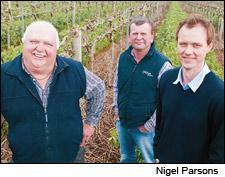 Ed Schild, Michael Schild and winemaker Scott Hazeldine stand in one of their Barossa vineyards. Faced with strong demand for a highly-rated wine, an Australian winery has simply created more of it. Wine Spectator has learned through an investigation that Schild Estate, a family-owned winery in the Barossa Valley whose 2008 Shiraz placed in Wine Spectator’s Top 10 Wines of the Year in 2010, found itself running low on supply and decided to purchase, blend and bottle additional wine under the same label. While technically legal, the decision raises questions about the winery’s integrity and philosophical issues of what defines a wine’s identity. According to staff at Schild Estate, the winery produced about 45,600 gallons of 2008 Shiraz from their 400 acres of estate vineyards, bottling it in three batches in November 2009, March 2010 and October 2010. (Wineries will often assemble a blend of their entire production, but then bottle the blend in batches to better handle inventory.) About 5,000 cases were sent to the U.S., where the wine retailed for about $20. Wine Spectator rated the wine 94 points (outstanding on our 100-point scale) in the Dec. 15, 2010, issue, and then ranked it No. 7 in our Top 100 Wines of the year, published in the Dec. 31, 2010, issue. Demand for the wine increased dramatically. Tipped off by an Australian source, Wine Spectator recently learned that the winery responded by buying and blending an additional 5,000 cases of 2008 Shiraz, bottling it under the same label. "We found ourselves in the situation where we are running shorter than expected on domestic stocks of ’08 Shiraz," Schild winemaker Scott Hazeldine told Wine Spectator when asked about the new bottling. "In order to get us through to a stage when the 2009 will be ready for bottling, I have been asked to put together an additional blend for sale in Australia." The 2009 is scheduled for bottling later this month, to be released in Australia in June. "The last sourcing was from a local grower, and it has been matched as closely as possible to the original blend," general manager Casey Mohr told Wine Spectator. "The sourcing of a second blend was not taken lightly by the team." Hazeldine stressed that wine was not intended for export to North America, but confirmed that the blend was "over and above the original." Wine Spectator has been able to blind-taste wines from two of the original bottlings and found them consistent in quality and character. However, we have not yet been able to review the new blend from the latest bottling. Schild promised to send samples through its U.S. importer. Consumers may have difficulty discerning the differences simply by reading the official label. Wine Spectator learned that the labels for the original wine and subsequent bottlings all identify the wine as Schild Estate Shiraz Barossa 2008 and list the American importer, making no distinction among the various bottlings. However, after reporters contacted Schild for clarification, the winery offered to affix an extra label to the recent bottlings, identifying them as a second blend. "This will enable discerning consumers to note that this is a different blend," Mohr said, adding that the winery put itself into a difficult position by reallocating stocks originally meant for the Australian market to meet U.S. demand. All bottles of Schild also contain a code, usually located under the back label, that identifies when it was bottled. The bottling code begins with the letters BBS, identifying Barossa Bottling Services, Schild’s bottler. On some bottles, the next character is the letter L and either a 9, 0 or 1. This refers to the year (2009, 2010 or 2011). The next three digits denote the day of the year, with 001 being January 1 and 365 being December 31. So, a bottle that says BBSL9331 was bottled in 2009 on November 27. On other bottles, however, the sequence starts with BBS and then there is a four-digit number, which, according to BBS staff, denotes the time the bottle was filled—for example, 1712 means 5:12pm. That’s followed by an L, then the last number of the year 9, 0 or 1, and then the 3 digits denoting the day. So, a bottle that’s coded BBS1716 L0312 was bottled at 5:16pm on November 8, 2010. Bottling different blends under the same label is perfectly legal under Australian wine law, so long as the label accurately describes the type and origin of the wines. This is common practice for low-priced commodity wines, but a rare occurrence for wines that have received high praise from critics or won awards. No winery has been prosecuted for this in Australia. A bottle of the original Schild Estate Shiraz Barossa 2008. This is partly because of how difficult it is to prove that the wines are not the same, according to Steve Guy, responsible for compliance at the industry organization Wine Australia. "For instance, if one blend had won a trophy at a wine show and then a totally different batch altogether were presented under that brand, carrying the same award, this could be considered to be deceptive," said Guy. It would be up to a separate government commission that monitors trade practices to deal with it. The additional bottlings came to light because Michael Twelftree, owner of Two Hands Wines in Barossa, also bottles his wines at Barossa Bottling Services. Two Hands winemaker Matt Wenk noticed additional runs under way for Schild Shiraz 2008 late last fall. “We find it incredibly disappointing that a company would take advantage of their position in the Top 100 in this way," said Twelftree. Apprised of the circumstances of the second bottling, Brian Croser, dean of Australian winemakers and a longtime industry leader, noted that the Australian Wine and Brandy Corporation Act (which created the group that promotes and oversees the industry) has a catch-all clause about "false and misleading conduct” that could lead to prosecution. “The practice as described is immoral and would be viewed as such by the vast majority of the Australian wine community,” said Croser. Editor's note: An earlier version of this story had incomplete information on Schild's bottle codes. The story has been corrected. And they are going to swear on a stack of bibles that the new blend sample is not from the orignial bottling, right? False and misleading conduct indeed. Oh the strange things greed will make you do. Nobody has to swear to anything. We know the bottling codes, which are engraved on the glass, and can taste for ourselves. Can you check your numbers? At 2.4 gallons per case, the quantity of Shiraz you mention (170K gal) would have produced a lot more than 18K cases (more like 70K). Wow, I just bought two bottles of this wine yesterday. When I get home, I will check the bottling code to see which wine I purchased. I am currious to see if the new bottling remained domestic, or if they shipped the new bottling to the States. Amazingly, the slogan on Schild's website reads "Schild Estate’s reputation has been built on its commitment to translating the unique tapestry of its vineyards into wines that speak of honesty and drinkability." Too early for the March 1 bottling to make it to the US. You should be fine. You are right, pouring from one bottle to another would probably affect the taste. Thank you for pointing out our editing error. 45,600 gallons were made of the original lot. Thanks for the heads up! Out of all days, today I was finally able to find this wine at a local wholesaler. Even better, today is my Birthday, so I was quite excited until I read this article. Fortunately for me is that both bottles I purchased have the BBSL0 code. Thanks again for writing this article….way to stay on top of it! i bought a few bottles a couple weeks ago. i was actually surprised that, with all the great spectator press, the wine was a) still available, and b) still available for its original purchase price. now i know why. i will be checking my bottles when i return home from work, and if i end up on the short end of the bait-and-switch, i'll be contacting the retailer and demanding a refund. the clearly labeled "2nd blend" shiraz is not coming to North America so not to worry. Can onyone find the codes "BBSL1" and "BBSL0" on the bottles? Where is it? The code appears to be laser etched onto the sides of the bottles about an inch from the bottom. I found it quite hard to read though. I bought a couple of cases in early Jan /11. One has all bottles marked BBS1708 L0294, the other has all bottles marked BBS1618 L0294. I just picked another case up yesterday with the bottles marked BBSL0347 12:67. It would seem the last case I purchased is legit but I'm a bit confused by the markings on the first two cases. Mine say BBSL9331. I purchased the case October 30th, 2010. I am very disappointed with this company and will not be able to trust them in the future. Sean, is there any numbers/letters after the initial 8 digits? OK, everyone. None of the second blend is in the U.S. yet, and Schild says they're not going to send any. Unless you are in Australia, don't worry about bottle codes quite yet. If you want to know which bottling you have, here's the key: The first digit after BBSL is the year; 9 is the original bottling in 2009, and 0 is 2010. The final three digits are the day, from 001 to 365. There is also a time stamp at the very end. If you see any final-three-digit day codes higher than 334, let me know. Hi Harvey and thanks for your input and call for calm. I get the bit about none of the 2nd blend coming to North America but this article has left me curious about the whole code issue. Please see my previous comment for the various codes on my bottles. The first two cases I purchased have codes which don't seem to conform to the published format. The last case I purchased has a code which conforms with the format yet the day code exceeds 334. Perhaps this is actually a question for Cru Distribution? Your thoughts, as always, would be greatly appreciated. By “original bottlings,” it sounds like you’re referring to the November 2009 and March 2010 bottlings. And by “latest bottling,” it sounds like you’re referring to the November 2010 bottling. I think what you’re driving at is that any wine designated BBS L0335 or higher is a November 2010 bottling, and not "original." Please confirm. Anyway, I grabbed one of my bottles at random, and it’s got the BBSL0 designation. I guess this means it was bottled in 2010. To thicken the plot, it has a final-three-digit day code higher than 334 -- in this case, "BBS L0344" (checked twice, with consistent notes). It was purchased via mail order from Stirling Fine Wines in New Jersey (for information only, not intended to disparage this merchant in the least). FYI I opened one of these bottles about a month ago, soon after it arrived. It was delicious. So at least these aren’t true lemons, whatever the outcome of this investigation! PS -- The importer for my bottles is The Australian Wine Connection. Sorry, the bottling from 2009 would be first digit nine. "Andrew, you're right. The first bottling would have been in 2009, so the first digit would be one. You have one from the original bottling, which is probably the bottling run I reviewed. The one that ends in 334 seems to be a bottle that was filled in December 2010." Aside from this third new controversial batch, I was unaware that there were even separate botting runs to begin with. So I think this begs the question, is this a common practice? And wouldn't this make a difference as to what is actually in the later bottle? My four bottles purchased in early February all have a BBS L0351 code. Seem to be from the possibly questionable third bottling. Any clarification on this? To Lea. From the article, "The original bottlings all carry codes that begin with BBSL0." So am I confused or are you? I'm not being confrontational, I'm getting totally mixed up. What if the second bottling is even better than the first? I cannot find a BBSL designation on any of the 10 bottles I have. I see 2 lazer numbering sequences on the bottles. One has 1417U293 and right below it has AD5202101822. Any clues as to what these numbers are? Like most Aussie Shiraz, this wine is plentiful. Most on-line retailers report having the wine in stock and most are selling it at a discount. This revelation may have a ripple effect on retailers, who may be stuck with remaining stock. While the practice of creating new wine to mimic a highly rated wine is deplorable, the expression "caveat emptor" seems to apply as much to the wine industry as any other industry. This is a very interesting topic, because creating additional batches of wine is not illegal in the U.S. either, as long as the new wine conforms to TTB labeling laws. There is no requirement to indicate that a second or third bottling has occurred. We are exposing one of the areas of potential confusion on associating scores with a vintage wine label. The model works very well with more expensive, limited-production wines, often produced as one lot per vintage, and where transparency and authenticity are paramount in the eyes of the buyer. When you go down in price to the commodity volume brands, chiefly sold through supermarkets and distribution, the sales channel expects to be able to constantly restock shelves without losing the coveted space assigned to their brands. It is a cardinal sin to run out of stock, and therefore bottling runs of additional lots of wine are scheduled far in advance of planned sales. A possible 90-point WS score on a Woodbridge Chardonnay, for example, is unlikely to represent each and every lot of that vintage of Chardonnay produced by the winery, even though they rigorously sample lots in production to ensure consistency. I agree there is an ethical problem with producing more batches of a very high-scoring wine, but if this wine is marketed in high volume, I don't see an easy way for the consumer to not be confused. Editor's note: Since we published this report, we have learned that the bottle codes are not so straightforward and are working to determine what the codes are for all batches. We will append those to the story as soon as we have them. Thank you. A recent article published on the website of US wine magazine Wine Spectator has called the provenance of a Schild Estate wine into question. In November last year, the 2008 Schild Estate Barossa Shiraz was awarded 94 points and placed at number seven in Wine Spectator’s Top 10 Wines of 2010. Due to the unprecedented sales generated in the US by this high award, a decision was made by Schild Estate Wines to reallocate the majority of the 2008 Barossa Shiraz production to the US market. The 2008 Barossa Shiraz was sourced entirely from Schild‐owned vineyards, and with the 2009 wine months away from readiness, a second blend was carefully sourced from neighbouring vineyards to create a stop‐gap product for the domestic Australian market. To avoid any confusion in the marketplace, an extra strip label has been positioned on the front of each bottle clearly stating ‘2nd Blend’. “At Schild Estate Wines we pride ourselves on our commitment to translating the unique tapestry of our vineyards into wines that speak of honesty and drinkability. We hold ourselves entirely accountable for standing by the Schild Estate philosophy and motto of ‘Pure Barossa’,” Mohr continued. I'm completely confused.I bought a case and haven't tried it yet...still drinking the 2007! here's the numbers I found: BBS1716L0312 and AD5202171958. that looks like the 3rd batch? Purchased one batch in early January 2011 that's stamped 0334, then one last week stamped 0294. Go figure. Both begin with BBS0. How can the new wines be tasted blind if you plan on verifying the bottle lots, etc. Will these new samples be mixed in with random other 08 vintage Aussie Shiraz? I would hate any disappointment to taint a score. If the second run is good, and properly labeled, so be it. Labeling is a big deal though, and I am glad they were put through the ringer on that issue. All that aside, the first 18K run was simply stunning juice for the price. I hate to see this type of behavior from a winery that consistently blows me away with QPR. The 2004 is still the best QPR wine I have ever had. I went through about a case of it over three years and it was consistently stunning, and exceptionally balanced. Impossible to beat for $25 a pop. This news brings serious questions of the integrity of the practices of this producer. If they were so quick to "meticulously craft" a second blend to sell as the original do their previous winemaking practices "speak of honesty"? There intentions must be questioned as to whether they planned on shipping this wine to the U.S. to meet continued demand for this wine. It seems that only after the second blending was discovered did they agree to add an additional label to differentiate it and made the comment that none of this would see U.S. distribution. I think this bares comment from Harvey and any other editors as to how they view the general integrity of Schilds practices and how that will reflect the future reviews. Thank you. Joseph Kane- that is a very good question concerning the blind tasting aspect. Hopefully there will be an answer. Harvey, when will you get to those "philosophical issues of what defines a wine’s identity" that you mention at the end of the first paragraph? That's what I'd like to hear more about. This whole thread points to the issue. Whether the wines are close enough in taste or not is not the issue. It is an issue of brand integrity. The whole spectacle of having paying customers peering at laser-etched numbers on bottles says that Schild has compromised their own brand. Period. A brand is an assurance of authenticity. Schild does not understand that -- or treat it is their customers with profound indifference. The market needs to punish Schild by steering clear of their wines -- for years. Send a very clear signal to the industry. I'm relatively new to wines and have come to enjoy particular styles and grapes. One is Australian Shiraz and it was the pages of WS that helped guide me to this fact about myself. The Schild 2008 that I have been drinking is superb and that is an important point. Additionally, for my tastes, Schild produces some of the best shiraz at that price point year in and year out - with consistency from bottle to bottle. That speaks to me of commitment to excellence. FWIW, the code on a random bottle from my last purchase is BBSL0351. Note: the schild 2005 that i have been purchasing recently has a thin white label across the top that reads, Barossa Valley DESSERT wine. Hmmm what's that about? This is a far more common practice in the wine industry than you might imagine. Large production wineries very rarely bottle all of a particular wine at once. Portions of large blends are bottled as sales deplete inventory. If a particular wine gets good press and scores, its common for a large producer to 'stretch' that blend with additional wine in house or from the bulk market. You can spin however you want if you get caught with your hand in the cookie jar, but it is what it is. Denny Kleber - I have similar numbering on my bottles but purchased them at the end of February, 2011 in Vancouver, B.C., Canada - I also saw the wine for sale in Seattle - it is strange that it would be available in large quantities all of a sudden everywhere!! Can Cru Distribution the Canadian distributor guarantee that these wines purchased in Vancouver at the end of February are the first blend? Pauline---based on the shipping times alone, let alone the snail's pace that your gov't works on in regards to logistics timing, I'm 99.9% sure you are fine.